Christmas is a time most of us spend celebrating, gift giving and eating sumptuous meals with friends and family, all of which are a wonderful way to finish the year. Unfortunately the amount of waste generated over Christmas escalates as much as the celebrations do, but it doesn’t have to be this way. Here are some tips to reduce your waste over Christmas without reducing the festive spirit. An incredible amount of gift wrapping paper and Christmas cards are bought and then just thrown away afterwards, but there are so many ways to present gifts without generating extra waste. Try to think of alternative ways to wrap gifts. For instance doing a search on Google or Pinterest for newspaper wrapping ideas will show you how gorgeous presents can look simply wrapped up in old newspaper, without generating any additional waste. Similarly you could use fabric or scarves that can then be reused much more easily than creased gift wrap. Gift bags can also be used over and over, and so are a less wasteful option than wrapping paper. If you need to protect delicate items then you could opt for shredded paper rather than buying plastic peanuts, bubble wrap or even new tissue paper. 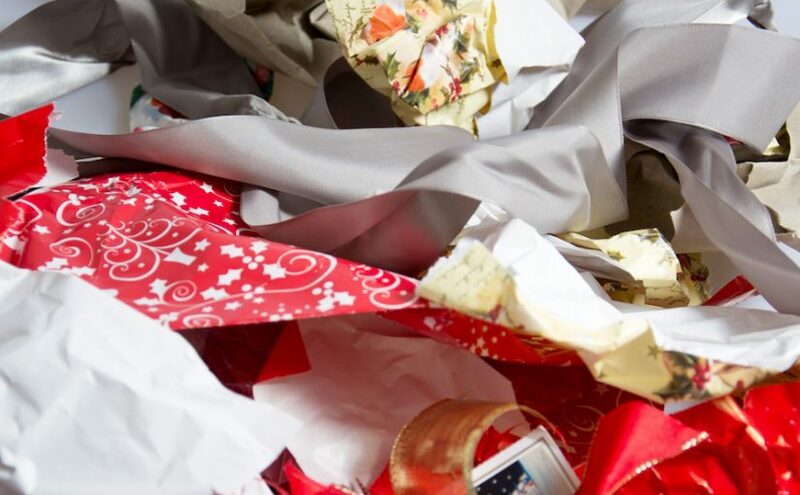 If you absolutely must buy wrapping paper, then choose paper that is recycled if possible and ensure that it doesn’t have foil or glitter on it. The same goes for Christmas cards – plain card can be recycled but not if it has glitter or foil on it. Regarding the gift wrap and cards that you receive, try to reuse as much as you can and recycle the rest. As an example, Christmas cards and wrapping paper that aren’t recyclable can be cut up to make gift tags to use next year, so you get a little bit more use out of them before they end up in landfill. The best way to reduce food waste is to plan ahead. Instead of just buying randomly ‘in case’ you need it, make a list of exactly what you’ll need and stick to it. Particularly with food that goes off in a short time, try to buy quality over quantity – that way you and your guests still have a treat but without a whole lot of food ending up in the bin. It also helps to plan how you will use leftovers. Whether you plan to freeze them for another day or use them in recipes on Boxing Day and beyond, having a plan will help you not to forget about leftover food until it’s too late. And any waste from food preparation, such as vegetable peelings, can be composted. While it’s wonderful to give gifts to friends and family, it can sometimes be the case that we just buy something for the sake of it, and it ends up as clutter or waste in that person’s home. If you’re not absolutely sure what that person would like for Christmas, then it can make sense to opt for edible gifts that can be consumed, or experience gifts that the person can enjoy doing rather than having to find somewhere to store a physical item. With regard to gifts you receive, if they are replacing something you already have then rather than throwing the old items away you could donate them to a charity shop, sell them on eBay or give them away on Freecycle. At least that way they won’t end up in landfill. If they’re no longer useful to anyone, then do at least make sure you recycle them responsibly, particularly with electricals. With a little bit of planning Christmas can be wonderful in every way, rather than something that adds to the waste. You might even find that the extra thought you put into wrapping, food and gifts makes this Christmas even more special than usual.